It may have only been a club night but to many people Thursday nights at Sheffield's Students Union could only mean Fuzz Club. For ten years during term time it stuck to the formula of having a 'indie disco' interspersed with two live acts. For a time it reigned supreme, organiser Penny Blackham had a genuine gift for guessing which acts were about to break through and there was a time when sell-outs every week were common. Sadly it's time has come and last Thursday the orange curtain closed across the stage for the last time and for the last time we were there when house lights went on at three in the morning. Another victim of the recession or simply coming to the end of what, for a club night, is long lifespan? Either way it doesn't matter. Fuzz Club is sadly no more. We're not going to pretend that we've been at Fuzz Club since the beginning, because that simply isn't true. However since we moved to Sheffield to start at the University it has been a often very regular staple of our week. For four years we've been assimilating the bands that went through it's doors and performed in front of a crowd drunk on cheep snakebite or delicious Jack Daniels and Coke. Some of the bands have passed through our lives or were at their peak when they played Fuzz. Others have since gone on to make a huge impact on our lives, some because of their performances there, some for other reasons. There's a massive list of bands and we can't list them all, so here's the pick of the bunch. For nine years of its life Fuzz Club was helmed by Penny Blackham. Upon her starting work for the Students Union Fuzz Club was a new night that was in serious trouble. The options were either for Penny to rescue it, or it would be scrapped. Using contacts that had been built up from her work in record shops around Sheffield in the 1990s Penny built up Fuzz Club from nearly nothing. Every Thursday of term-time saw two live acts play, before an indie disco that, at its peak was the highlight of the Sheffield club scene for those interested in guitar based music. Not content with simply providing the thrills of the fuzzy variety, the second room hosted a sister event: Bleach. Bleach was there to deal with the heavier end of things; punk, ska, hard rock and of course metal were it's repertoire and although there were few people who went for both Fuzz and Bleach they complimented each other nicely. The middle of the 2000s saw the massive indie boom, that we're only now seeing the back of. Unsurprisingly this proved to be something of a heyday for Fuzz Club. Those events during the academic years of 2005/6 and 2006/7 saw sell outs nearly every week. During this time the local scene around Sheffield and Leeds was truly finding it's feet. At various points pre-success The Long Blondes and The Pigeon Detectives essentially acted as house bands, stepping it at less than a moments notice when groups pulled out or Penny was at an odds what else to book.Even excluding these two acts Penny has over the years shown an amazing talent for predicting which acts were destined for the big time. A quick look at the list above shows but those that have gone through in our time. Those that have been around a little longer than us delight in telling tales of The Subways, British Sea Power, The Killers and Maxïmo Park coming through. As good as the indie boom was for Fuzz Club, the bust was bad for it. It seems to us that the downslide started around the time that certain areas of the music press decided that guitar based music was old news and begin the subculture that became known as nu-rave. Fuzz attempted to shift with the times, however the disco inserting more bleepy music into its playlists did nothing but alienate the old crowd. Whilst most punters at the night enjoyed variety in their night the obscurity and unpleasantness of the music and the crowds it catered to proved too much. Bleach similarly lost out by attempting to cater to the fickle emo scenesters. The metal fans were scared away and thankfully never came back to a night that seemed an embarrassment to its former glories. Last summer 'think tanks' were held to determine the future of Fuzz Club. The advertising was changed to something more 'cut and paste' and the disco was righted. Guitar music was not only back in but the pallet was expanded to include more older anthems. It worked superbly and Fuzz recovered creatively from it's lull. Sadly the writing was on the wall. Those that had left in the nu-rave days didn't come back and numbers didn't recover and a few high-profile cancellations were nails in the coffin. The last semester of Fuzz Club saw it celebrate its tenth birthday with one of it's best semesters of all time. Now almost completely under the control of Penny's protégé Simon Jenkins old favourites such as Art Brut and Brakes were bought back. The actual Birthday had local post-rock legends 65daysofstaic and Young Knives were bought in for the last one of the year. So there we were. At the last ever Fuzz Club. Young Knives had just played one of the best ever sets that we'd seen at the night, closing with 'She's Attracted To' and we were into the disco where we were determined to stay until the three fifteen finish. We got our list of requests in, attempting to get all of our anthems delivered to us by DJ Badabing for one last time. He didn't disappoint, and although we had to go without 'Suspicious Character' we got 'Do You Remember The First Time? ', 'You! Me! Dancing! ', 'Apply Some Pressure', 'Once And Never Again' and the greatest Fuzz Club anthem of them all 'Float On'. Three o'clock neared and 'Time Was Running Out' was played. Unusually for recent months Fuzz was still nearly full. We weren't the only ones wanting to stick it out to the very last. The opening notes of 'Common People' came as a nice surprise and once it was finished we rested to the barrier for the final song. The Smiths 'I Know It's Over' has never really meant anything to us, until now but as it filled the Founrdy the room stood looking around in silence for Fuzz's appropriate final song we did feel really quiet emotional. At the end house lights came on and we said our goodbyes and thanks to Penny and DJ Badabing. Fuzz Club was never just a club night. Not to us or to those that attended semi-religiously. And if nothing else it will be missed like no other club night before it. 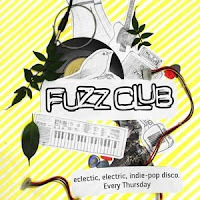 We're sure whatever gives the students of Sheffield University their dose of indie and rock in the coming years will do it's job and do it well, but it's a testament to everybody involved in Fuzz Club over the years that it'll never truly replace what we had here.